When it comes to Indonesia, most tourists head straight to Bali. But I’m not most tourists. 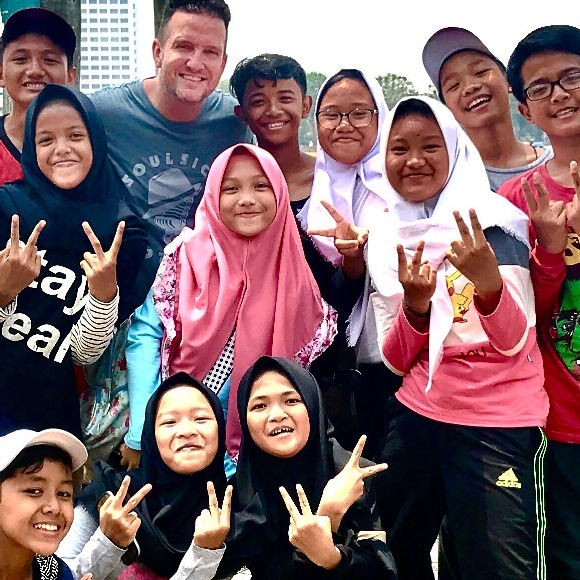 And the magic that I discovered in the city of Jakarta earned it a spot on my list of “places I need to live one day.” I’ll never forget all those precious smiles glowing under hijabs and groups of kids stopping me on the street for pictures. 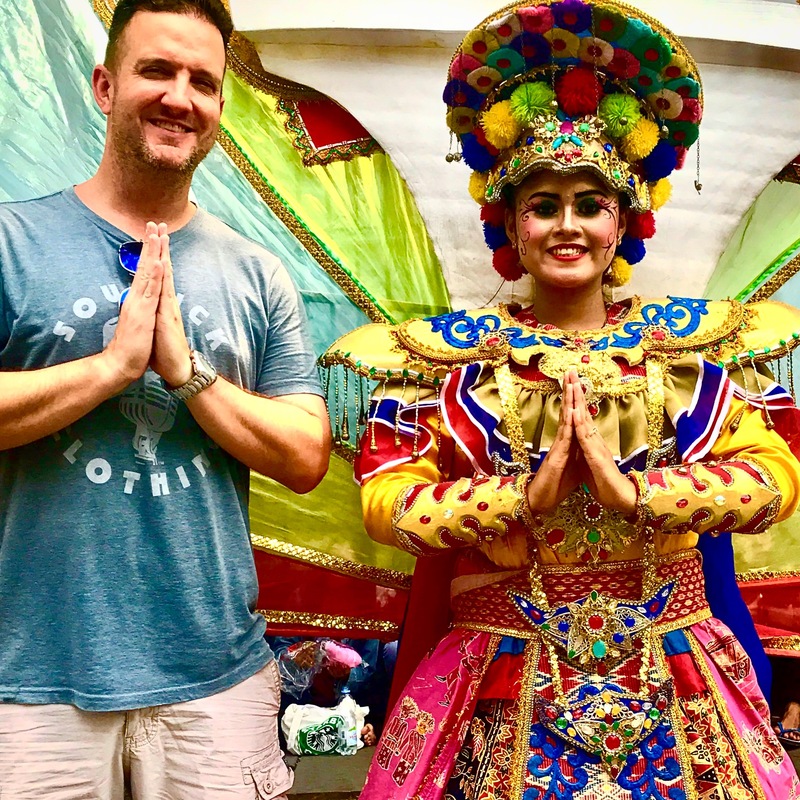 Most tourists head straight to Bali. I wanted none of that. 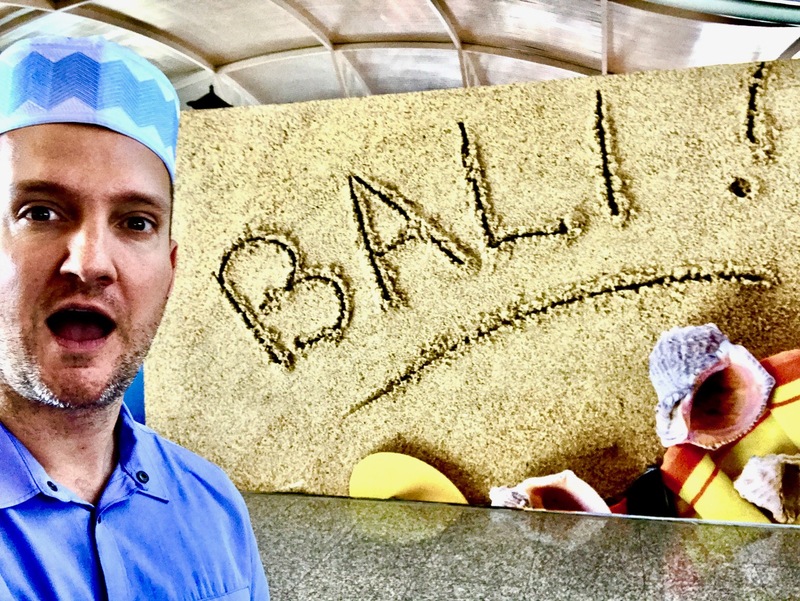 Actually, I do want to visit Bali one day, but the sheer amount of tourists I saw in the airport during my layover there gave me anxiety. 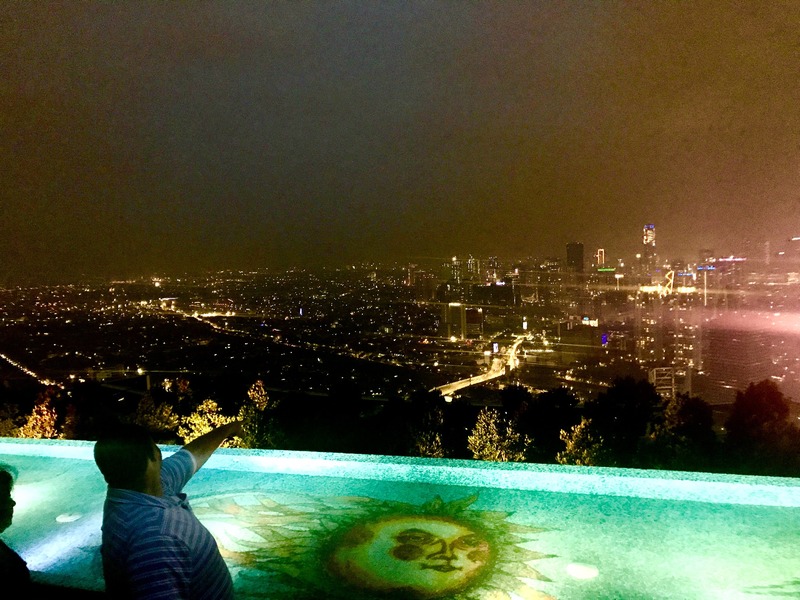 I made the right decision choosing Jakarta for my short time in Indonesia. 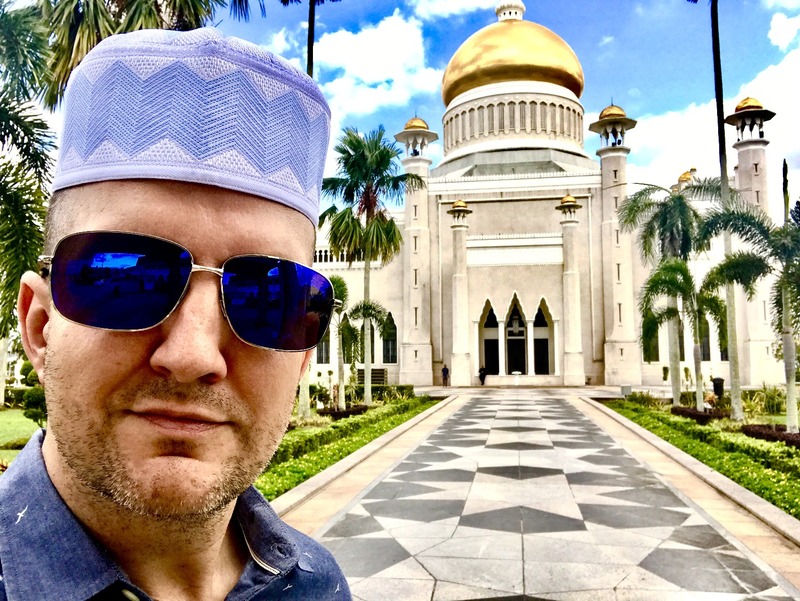 While Bali’s airport was teeming with gringos in flip-flops and surf attire, Jakarta felt like more like the real Indonesia, as the Australians/Brits/Americans disappeared, replaced with folks in hijabs and kopiah caps. Now this was Indonesia! I’d never seen so many malls in my life; literally dozens and dozens of huge architectural commerce cubes on each side of the freeway as my taxi driver ushered me from the airport to my downtown hotel. Seriously, there were so many giant malls in every direction, I wondered how they all stayed in business. Maybe Amazon didn’t exist in Indonesia? So many malls, my brain was confused trying to figure out the economics of this equation. 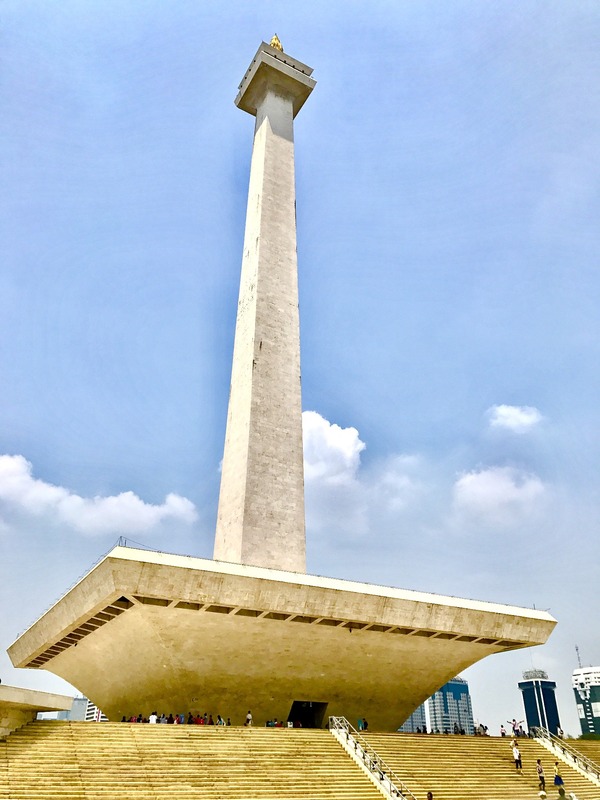 I had exactly 24 hours in Jakarta, and while I was pooped from the insane week of travel, I refused to spend even one second not exploring this fascinating city. But I was pooped. This was the end of a four-country, eleven-day trip, and the last country is always the one I where I have the least energy. I’m usually on the verge of collapse by the time I reach my final stop. 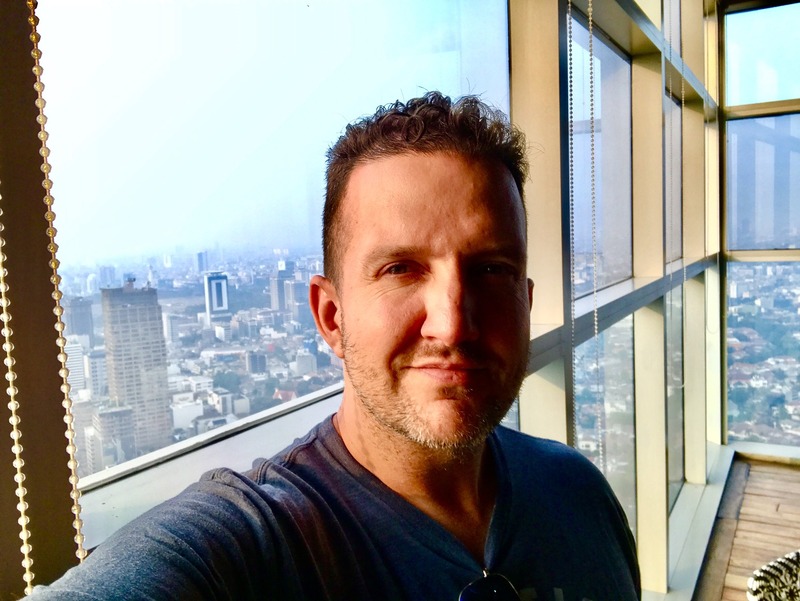 Luckily for me, Jakarta is home to some of the biggest and best spas/massage parlors in the world. 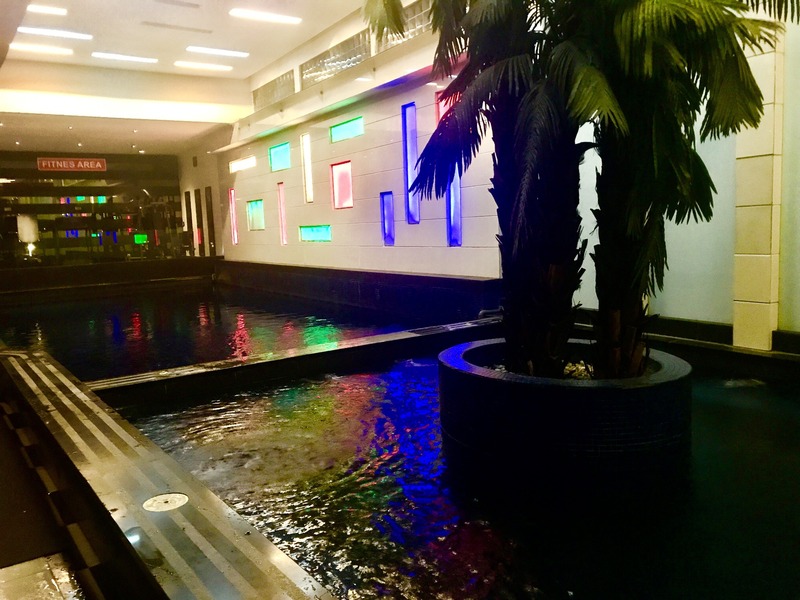 The capital has dozens of huge, lavish spas–just for men–all with discos, pools, saunas, steam rooms and bars. I couldn’t think of a better way to spend my last night in Asia than with a relaxing massage to loosen me up before the long flight home. I mentioned these spas also had bars? Ahh yes, a couple of beers and a 90-minute rub down. Just what the doctor ordered. First though, some dinner. Across the street from my hotel was a giant mall (who woulda thought?!) called Sarinah. I was too tired to be picky, so I opted for McDonald’s. Quick and easy. Or was it??? This multi-level McDonald’s looked more like a nightclub. The music was bumping and the place was so packed that I couldn’t even find a chair! This McDonald’s could’ve passed for disco if they would have just had the bouncer and red carpet out front. Totally wasn’t expecting this. I grabbed my food and then searched for an empty seat like a freshman on his first day of high school. I snarfed down my Big Mac and then sneaked out, not wanting to be the only loser eating alone in what seemed to be the social gathering spot for the city. I love taking note of the special selections on foreign McDonald’s menus. 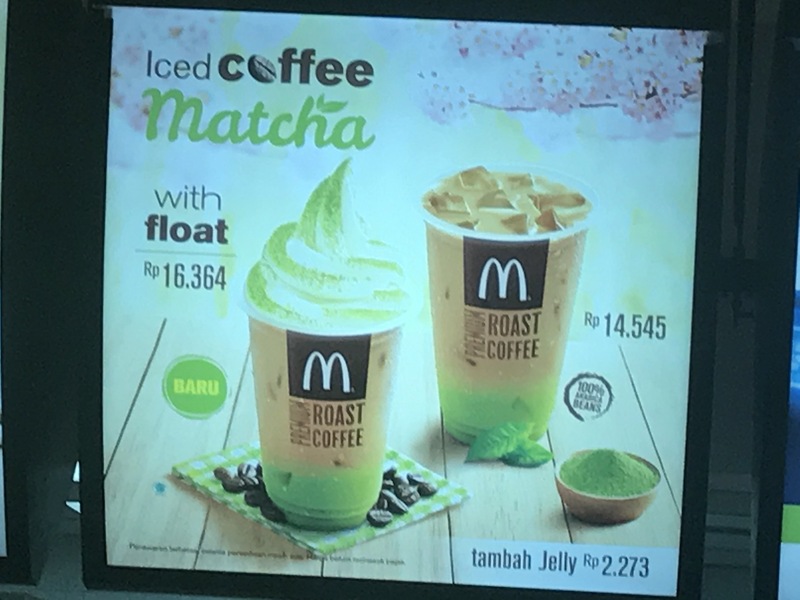 This one featured matcha iced coffee. Okay, time for Papa’s massage. I jumped into a bajaj (Jakarta’s version of the tuk-tuk) and headed down to the spa. The city was jumping–the streets were packed with so much traffic and people for such a late hour. I enjoyed the ride in this little motorized cart and loved taking in all the sights and sounds of a busy Saturday night in Jakarta. Minutes later I arrived at the Fortune Spa and was ready for a little me time. I started with a local beer in their club, which was pretty empty except for two other tables. A group of girls playing billiards smiled and giggled at me, and I smiled back; but quickly scurried along when I noticed some tough looking dudes sitting in chairs next to the pool table. These ladies had dates. After enjoying my suds, I headed over to the lockers, changing into the trunks and flip-flops provided by the club and then over to the pool for a dip. There was a huge, piping hot Jacuzzi which felt fantastic on my weary bones. I could’ve stayed in that tub for two hours, it was amazing! I can’t say the same for the arctic-ice cold pool…yikes! I baked in the sauna and steam room for a few minutes before showering off and heading upstairs for my massage. It was heaven. Her name was Reza and she was a very nice young lady from Surabaya. And that’s all the details you’re getting out of me from that night. The hot and cold pools at Fortune Spa. After the day’s exhaustive travel, the beers, the massage, Jacuzzi, and steam room…I was about to pass out. It was straight back to the hotel where I was in a coma not more than 30 seconds after my head hit the pillow. Lights out. Unfortunately at 4:32AM I was shaken out of bed by a blaring concert taking place on the giant soundstage located just feet from my room. 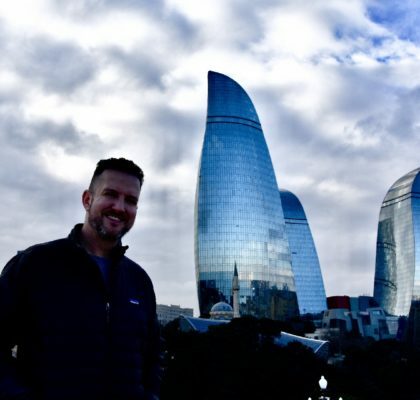 I didn’t know if I was under attack, being Punk’d, or if this was all a dream–but the deafening decibels piercing into my room before the sun came up were unbelievably loud. I was so confused. Why would a concert be taking place at four in the morning???!!! It was maddening! And I really needed a decent’s night sleep. I looked out my window and sure enough, they were doing soundcheck down below as they were setting up what looked like to be a giant festival. The eight lane city road below appeared to be closed off to vehicles and some kind of giant street party was being put together. But why at 4:30AM??? Why Jakarta, why??? I buried by head in pillows and tried my best to get some sleep, but my efforts were futile. The festival below, at 7AM. After a whole lot of tossing and turning and cursing, I was able to sneak in just a few Zs before stumbling down for breakfast around 7AM. I enjoyed the Indonesian breakfast buffet at the hotel before hitting the streets for a day of exploring. I sure needed some more sleep, but it was obvious I wasn’t going to get any. Hey, if you can’t beat ’em, join ’em. Well I finally figured out what the heck was going on with the 4AM concert. It was sound check and set up for a giant street fair that takes place every Sunday. 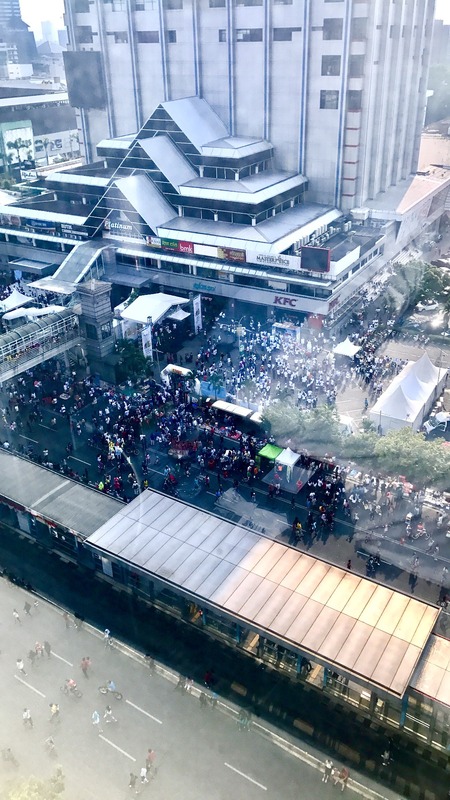 The official name for the event is Car Free Day Jakarta, where the major thoroughfares that are Jalan Sudirman and Jalan Thamrin are closed to all private vehicles. What originally began as a government initiative to help reduce pollution, Car Free Day is now a Jakarta tradition. I slipped in to the crowd and tried to go with the flow, merging in to what looked like a giant school of human fish: the thousands of folks that filled the big boulevard to walk, run, cycle, skate and stroll. There was street food, circus-like displays and other public events, like concerts. Loud concerts. I’m such a grumpy old man. I just wanna talk to the genius who decided on making the festival times 6 a.m. to 11 a.m. Why??? Seems noon to 5 p.m. would work so much better for everyone. 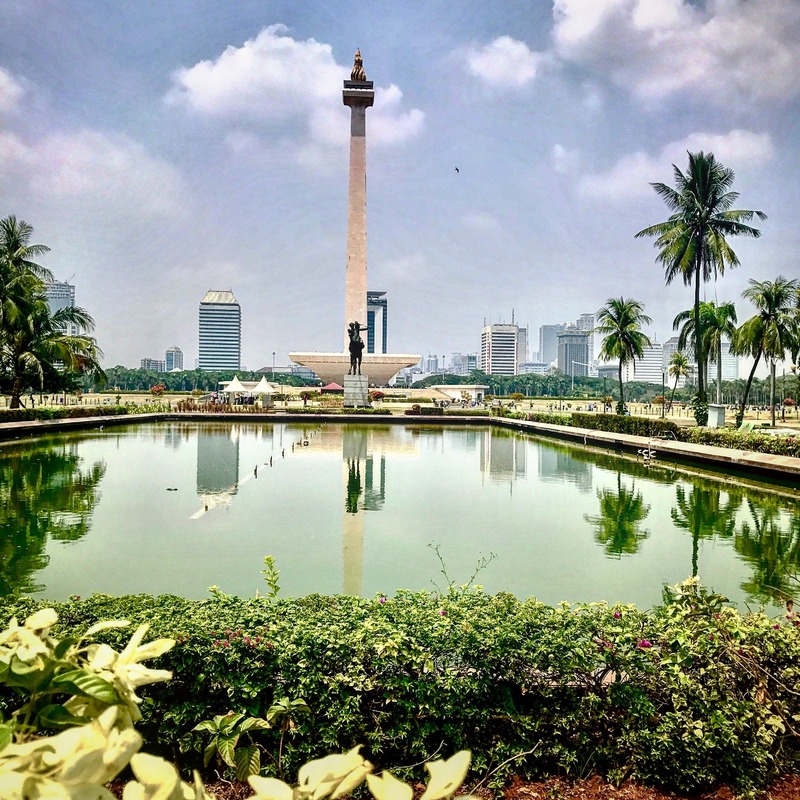 As I worked my way north, I soon left the festival and segued into Merdeka Square where the giant Monumen Nasional towered over a giant park, full of trees, grass, water fountains, and concrete walkways. I enjoyed walking around the monument and exploring the park, although it was miserably hot. There was a small souvenir market inside the park, where I stopped for a coconut water in an attempt to cool off. The highlight of my stroll through the park was running into a group of teenagers donning hijabs who asked to take a picture with me. But why a photo with me? It seemed they just wanted a selfie with an American. They hooted, hollered and giggled sheepishly when I recorded a Snapchat. So cute! Little did they know that I was probably more excited to take a picture with them! These special local interactions are what I live for and are never promised. I can’t tell you how much these encounters warm my heart. Panorama shot of Merdeka Square. Hats for sale. 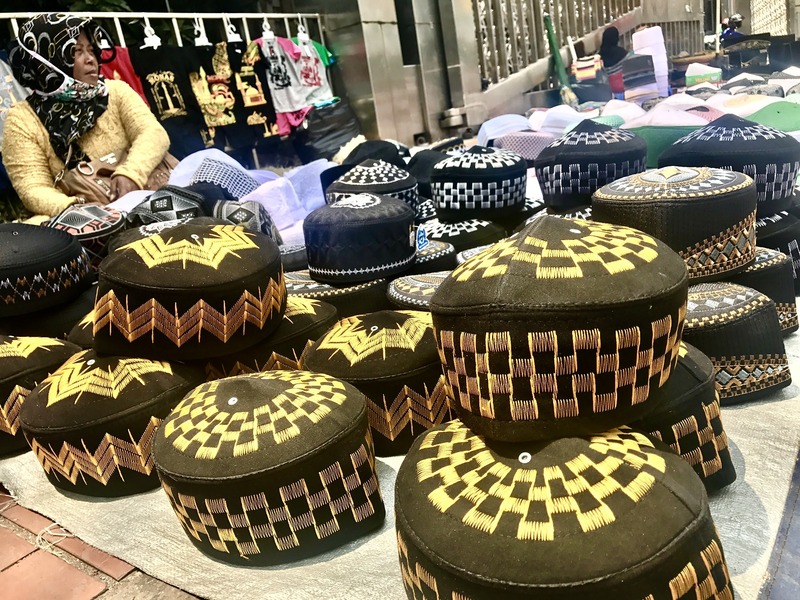 The songkok or peci or kopiah is a cap widely worn in Indonesia, Brunei, Malaysia, Singapore, the southern Philippines and southern Thailand. I was so darn hot I felt I was nearing heat exhaustion. It was Death Valley-hot, with all the humidity of Southeast Asia. I knew if I didn’t hydrate myself I’d pass out at any moment. I spotted a woman selling cold drinks in a cooler, and chose a bottled iced tea. I just needed something cool in my system. I ripped off the top and gulped it down, but didn’t realize what a surprise I was in for. It only took two sips for me to realize this was the best bottled iced tea I had ever drank in my life. The secret: jasmine. 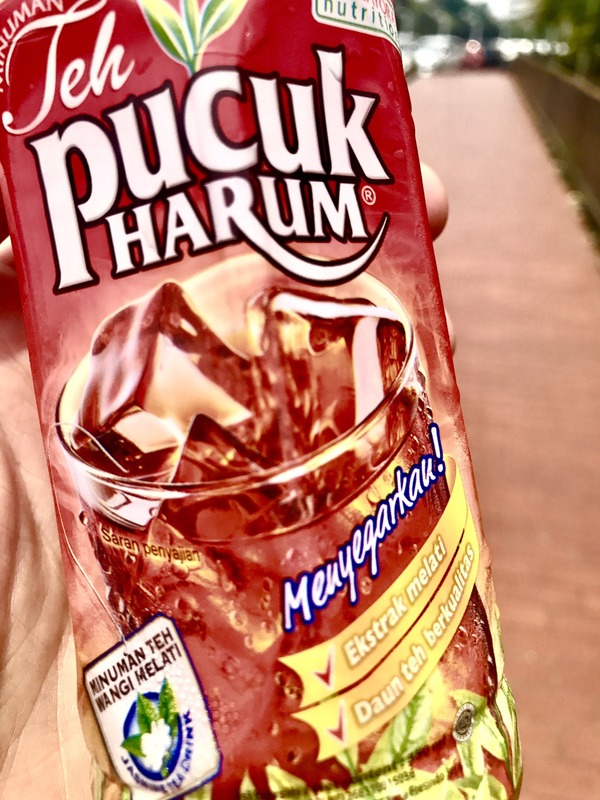 If you’re ever in Indonesia, do yourself a favor and locate some Teh Pucuk Harum. Ridiculously amazing! After my life-changing tea discovery, it was back out to the street, where I stumbled upon a free “tourist” bus. I jumped inside and enjoyed the shade and the luke-warm AC for 15 minutes before exiting at Kota Tua (Old Town.) Now this place was really jumping! I usually detest going places packed with tourists, but the visitors clogging up this area all seemed to be Asian. I didn’t see any Americans or even Europeans for that matter; I was the only gringo in sight, which I liked. I even got stopped again for a photo, this time by four young girls dressed in pink hijabs. You would’ve thought I was a movie star or something; it was so flattering to be stopped by total strangers for photos. Not gonna lie, I really enjoyed it–so fun! 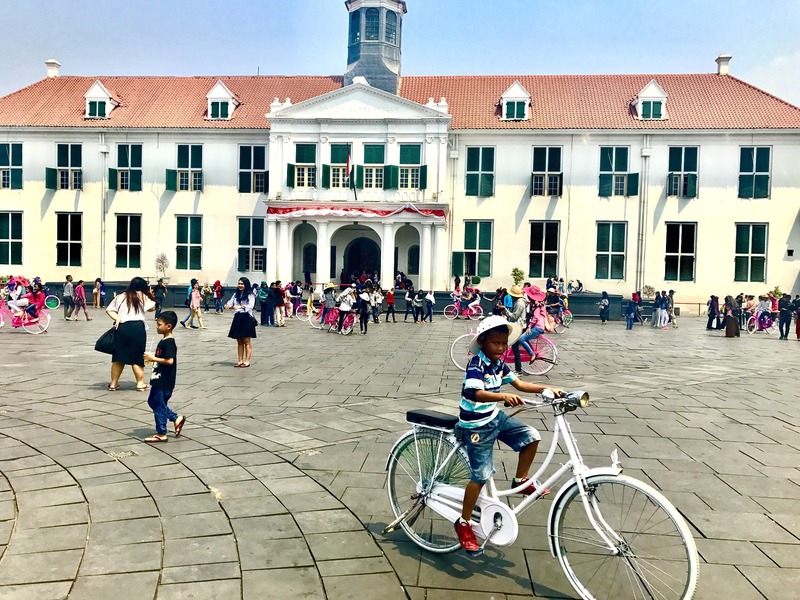 I quickly learned that the Dutch once controlled Indonesia–I had no idea! “Old Town” Jakarta is what’s left of Oud Batavia, the first walled settlement of the Dutch-Jakarta area. This was an inner walled city with its own castle, established as the de facto capital of the Dutch East Indies. It was a center of commerce and super important to the spice trade. All this stuff never interested me when I had to read about it in seventh grade social studies, but suddenly all of it became so very intriguing to me. 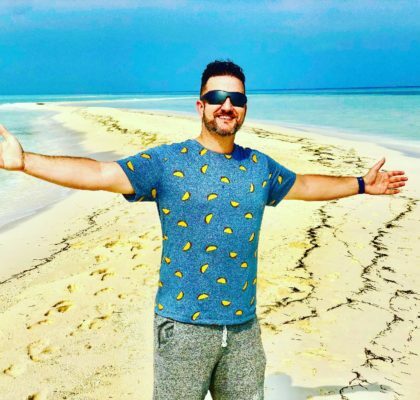 If I could only go back in time and sit the 13-year-old Randy down; I’d explain to him how important all this stuff was and implore him to pay attention in class–I would need it later! Meandering around the main square of Kota Tua was probably my favorite part of my visit. Besides the selfies with the young ladies, what a neat surprise it was to see so many people just having old fashioned “fun” with each other in the square. You could rent bicycles–white for the men, pink for the girls–and every rental came with a hat. The girls donned big floppy pink hats, while the boys strapped on safari/explorer hats. It looked like the bike path never left the square; folks were just peddling in circles. I couldn’t help but smile; I felt so good seeing people so happy from such a simple thing as riding around in circles. Their laughter and squeals of pure joy just warmed my heart! Simple pleasures bring the square alive: kids pedal bikes in the square. I might have mentioned it was hot. I needed to cool down again. I’m such a lightweight. I found a cab and went back to my hotel to enjoy some of that precious AC and rest up a little. The long journey home would begin tonight and I didn’t want to overdo it. After a nap, I packed, checked out of my hotel, and had the concierge store my luggage. 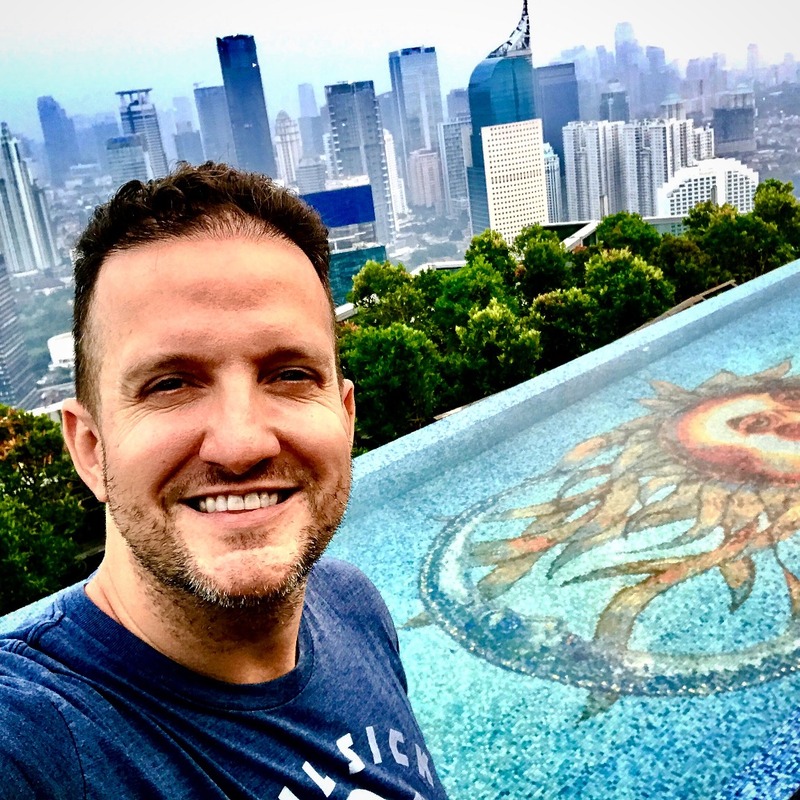 It was off to enjoy the last few precious hours of Jakarta before heading to the airport. I grabbed a cab and cruised over and up to the Skye Bar and Restaurant. 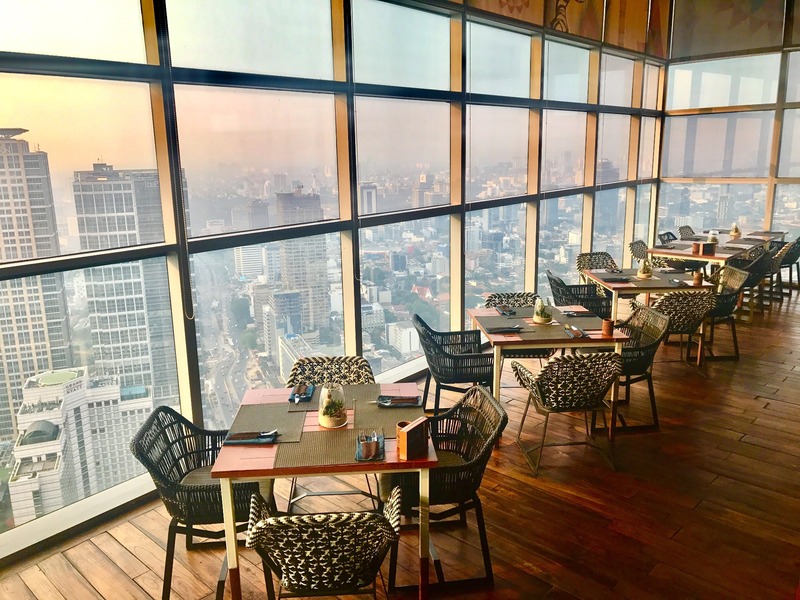 Perched atop Jakarta’s BCA Building, Skye sits on the 56th floor and offers stunning views of the city. The food was even better than the scenery. My Wagyu beef plate was some of the best meat I’ve ever tasted. 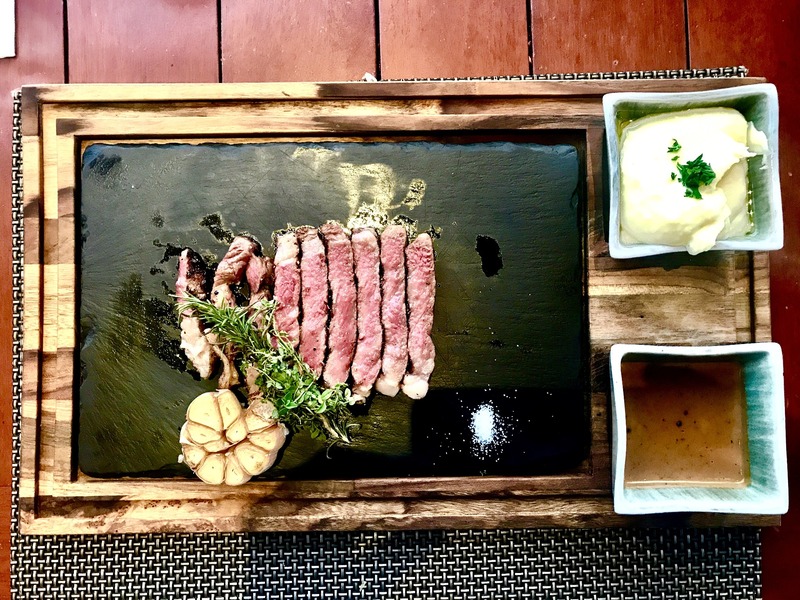 Served on a slate with a sprinkling of salt on a pile to the side, this was some of the tastiest, most tender beef I’ve ever experienced, rivaling that of a Brazilian steakhouse’s picanha. So amazing! I enjoyed that superb meal before moving out to the rooftop bar for a couple fancy cocktails to watch the sun set on Jakarta. What a nice ending to such a fantastic day! Views all around at Skye. 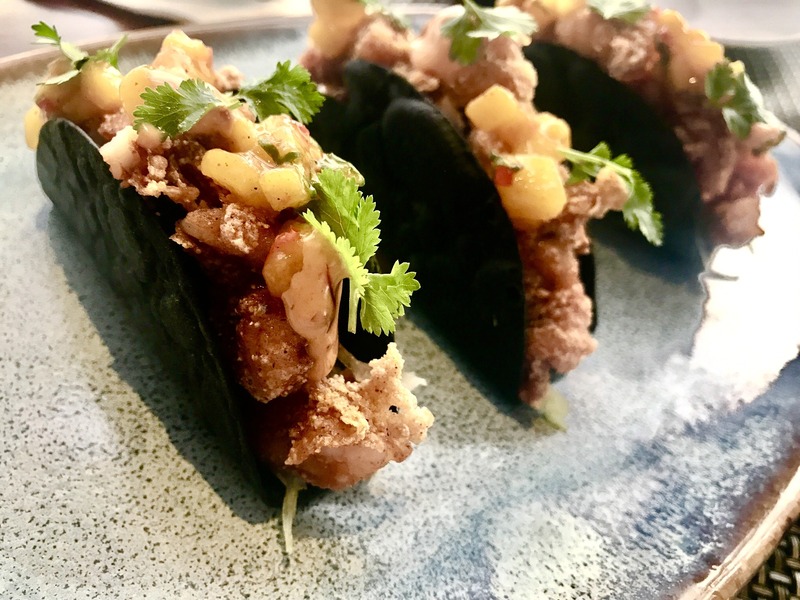 Starter: crispy shrimp tacos with mango. A work of art: Masterkobe Wagyu sirloin. Heading back to the hotel, I took a detour through one of Jakarta’s thousands of malls. I had to see one inside for myself. It was packed, and I once again wondered how any city could support so many giant malls! The place was enormous, super clean, and its food court was fancier and more intricate than any I’d ever seen! 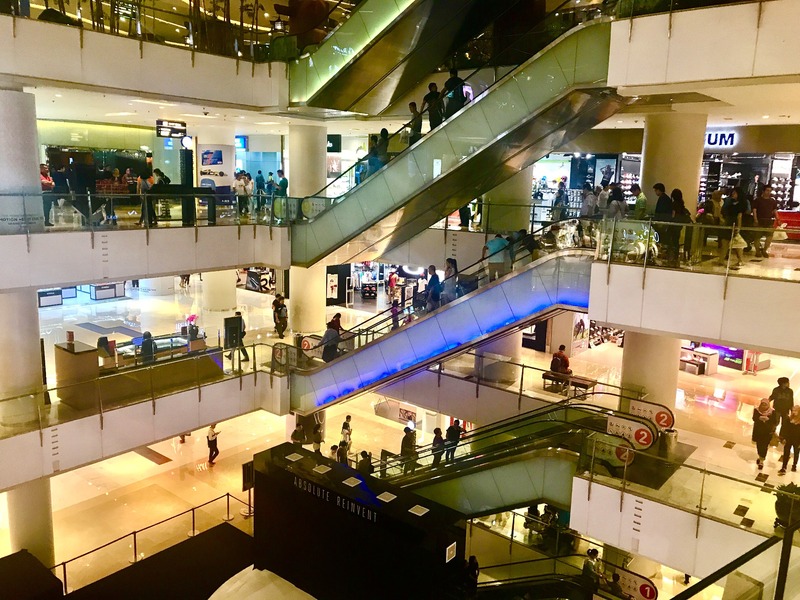 The Grand Indonesia: Two buildings, eight levels and is divided into three main districts, Specialty Zone, Main Zone and Crossroads of the World district. It’s also home to the largest Sphere X theater in the whole world, which has a huge curved screen as large as a basketball court! Sadly, it was time to go home. But I didn’t want to! 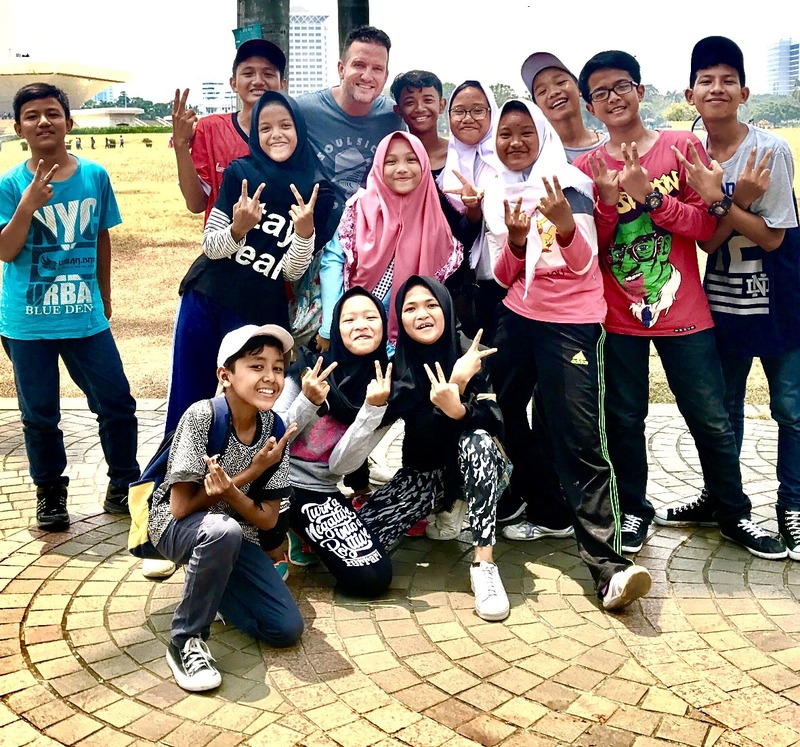 Wow, what an awesome 24-hours in Jakarta! 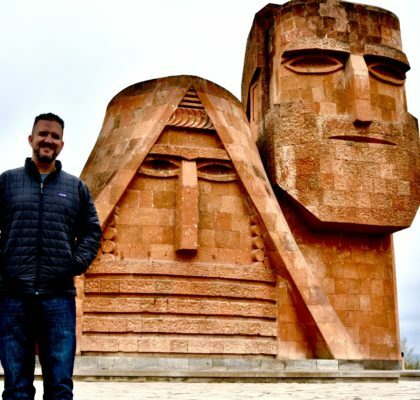 Let’s recap: A memorable visit the “Disneyland” of massage parlors, a big weekly street party (a little too early, but whatever), beautiful monuments, a fun-filled old town, the best bottled tea ever, giggling kids that love to take selfies with foreigners, amazing steak to go with amazing views, and a million beautiful malls. That was my takeaway from Jakarta. Overall, I am just so thankful I chose Jakarta over Bali. 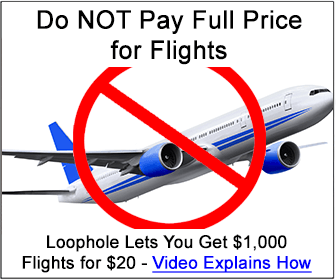 It was simply a coin-toss when I was planning the trip. The coin landed just right. 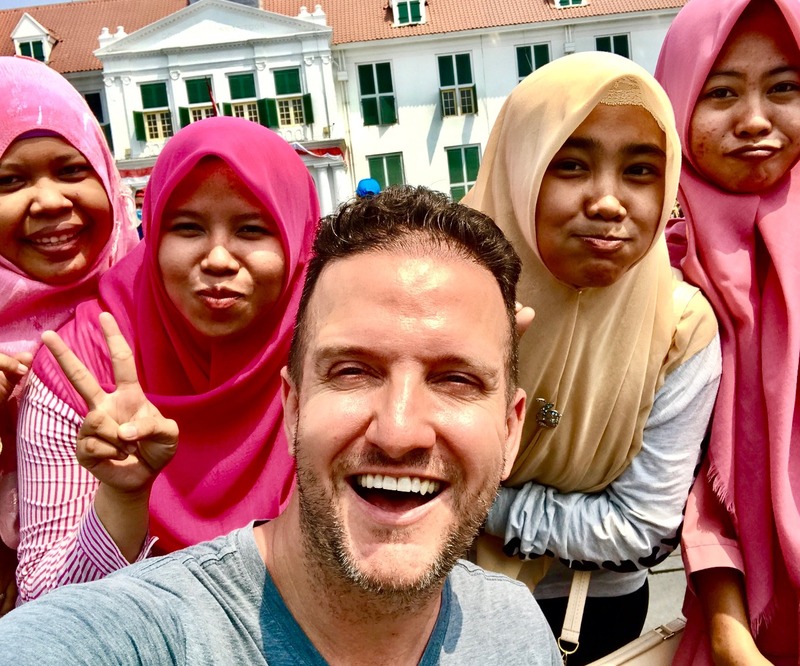 Here’s my day-long Insta-story from my time in Indonesia, where I captured the fun in 15 second increments. Enjoy! And if you liked this story, or my website in general, please share! I am always amazed by the architecture in most of the countries you’ve visited. And the use of colors. And the richness. And the contrast to others that have virtually nothing and live in poverty. Many Americans don’ t know, or appreciate how blessed we are. You have brought this to our attention and I for one really appreciate it and thank you for that. Hello. 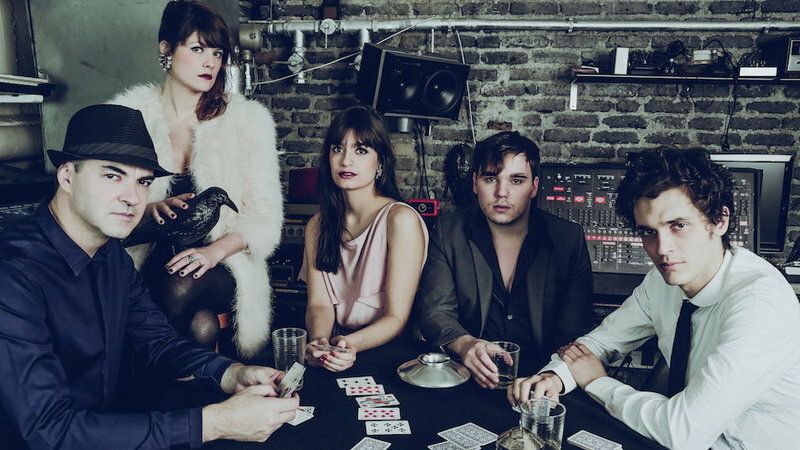 I found your blog when i was trying to find Algiers, i like reading your blog. Im Jakartan nice to know that you like Jakarta too. So great to meet you! 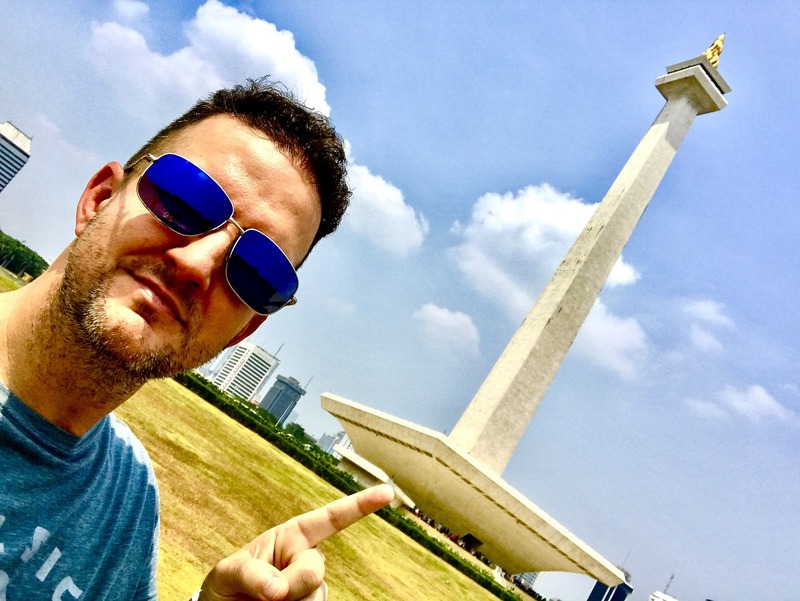 And oh, man–I ADORED Jakarta…a city I can’t wait to come back and see!